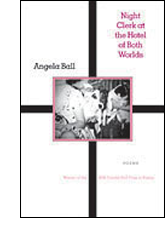 Angela Ball's Night Clerk at the Hotel of Both Worlds, winner of the 2006 Donald Hall Prize in Poetry, while driven by strangeness, is easily navigable by anyone willing to travel with her down the road to absurdity (as I did once as her student at the University of Southern Mississippi & I think we hit a deer). “So fragrant am I that bees/Follow me day and night,” she writes in “Someday I’ll Take Again My Lightning Drive Through Love,” in which troubled dreams about food & Home Shopping Club gadgeteer, Ron Popeil, transform into a trip into the country past “fruit stands and roadhouses” which, in turn, become “Accidental ballrooms” in the sleeper’s mind. If Ron Popeil can’t sell the book, what can I possibly do? Perhaps I could mention Ball serves such literary bigwigs as Shelley, Lord Byron, Apollonaire & Borges in delicious slices the whole family will enjoy, as well as poems about fences, dogs, power steering, high rises, inadequacy, divorce & spring, each with her characteristic comic aplomb, perfect for holidays & special events. Were I to offer a criticism, I'd say line breaks often seem flat--that's phlat for the hipster in you. If you have a hipster in you, it may be the sign of a more serious condition. Please see a doctor immediately. I'm not a doctor. 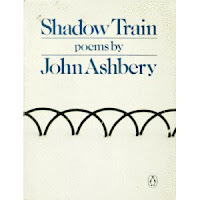 John Ashbery's Shadow Train consists of fifty 16-line poems, just like George Meredith’s Modern Love, sometimes described as a novelette in verse, but no one has suggested Ashbery has provided a storyline here. If so, it’s even less discernable than the thin thread of plot of his later book, Girls on the Run. Does it matter if a storyline exists, given that Shadow Train, as no one in particular stated on the cover, is about “language on a very plain level” & “the truth inside meaning”? Also, is that really an accurate description of the contents? Obviously, you can't judge a book by its cover, as they say, whoever they are, the phony bastards, but the recurrence of the second person pronoun in each poem–whether addressing the plurality of readers or a singular, personal you–lends the work at least a hint of serial quality. Do these poems, then, detail a love affair, as in the Meredith poems? If so, why don’t I, a devotee of the New York School, know anything about it? 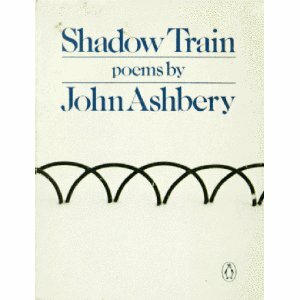 My main complaint is that I'm old & lonely, but as for Ashbery, too many of his poems are essentially the same. For instance, which is better–“Some Old Tires” or “Indelible, Inedible”? Either choice is based more on preference than objective criteria. Furthermore, remove “Paradoxes and Oxymorons” & what’s left but a rather pedestrian collection of poems? No, leave it in. As far as modes of locomotion go, it's the book's cilia & flagella. A personal, rather petty complaint about J.A. involves my acceptance in the MFA program at Brooklyn College when I was in my early 20s & Ashbery was director of creative writing. I needed financial assistance to attend, so I wrote to ask him about a graduate assistantship, work-study or the like. I closed my brief letter by saying I greatly admired his work–indeed, he was the sole reason I’d applied at BC. In return, I received a crisp letter from his assistant–Anther Smugsworthy, if I recall, which clearly I don’t–not only instructing me to address all future inquiries to him, which, ok, I get, but also explicitly stating, in his most Smugworthian tone, that I was not to write directly to Mr. Ashbery again. Omigod, I thought. What a snot! So there. After many, many years, I finally, finally got it off my chest, but the question remains: where do I keep it now? A: My blog, where it will surely remain secret.